ROCKY TOP - MORE THAN A SONG! The name has spawned so many businesses and places in the Smoky Mountain area, I could not begin to name them all. ROCKY TOP SPORTS WORLD This "state-of-the-art" facility is the place for most any event! With 86,000 square feet, it's known for being one of the biggest, and the best venues! Whether you're into volleyball, basketball, wrestling, or martial arts, you'll experience a professional play area equipped with everything you need for an exciting game. The area consists of six basketball courts, twelve volleyball courts, excellent seating for spectators, an awesome concessions area that includes indoor and outdoor dining, and more! There are seven outdoor fields, and a champion stadium field! Planning a special event in the Smokies? With 40,000 feet of event space, you'll be able to entertain any number of guests! It's the perfect place to "play" in the Smokies. After the game, enjoy being surrounded by the beautiful Smoky Mountains. Travel a short distance for fun in Gatlinburg, Pigeon Forge, Sevierville, and Townsend! THE CITY OF ROCKY TOP We now have a city near Knoxville, TN who has changed their name to this famous song title! It's a tiny town off I-75 formally known as Lake City. These folks figured if they had a well-known name it would help grow their economy. As you make plans to visit the Smoky Mountains, you might add this little place to your agenda. It's only one hour 20 minutes away. The song, nor its writers mention a location, however, many refer to a barren summit located along the Tennessee-North Carolina border as its Smoky Mountain destination! The area is thought to be a sub peak of Thunderhead Mountain. The summit overlooks Cades Cove, and can be travelled along the Appalachian Trail. It's been a popular spot for hiking since the opening of the Great Smoky Mountains National Park, and has appeared on maps since 1934. Ah! 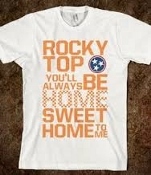 Those famous words...."Rocky Top you'll always be home sweet home to me..." It's the theme song for Tennessee! It's been around for years! Most everyone who hears this "wangy" tune has to either sing along, or stand to their feet! Where did it originate? What has it brought to us here in the Great Smoky Mountains area? The song originated right here in these hills we call the Smoky Mountains! It was written by Boudleaux Bryant and his wife back in 1967 right here in Gatlinburg! The Bryants were songwriters working on slow-tempo type songs for country music artists Archie Campbell and Chet Atkins. As a change of pace, they decided to do something up-tempo, and "bingo" this bluegrass sensation was born! It took all of about 10 minutes to write, and became a hit by recording artist Lynn Anderson in the early 1970's. After hitting number 17 on Billboard's Country Top 100, the University of Tennessee's band manager, Barry MacDonald came up with the idea and arrangements for the Pride of the Southland Band. In 1982, the song became known officially as Tennessee's 5th state song! The Bryants have since passed away, however the rights are owned by the Bryant children. Whether you're singing the song, climbing the mountain, playing sports, or visiting the city, you can be sure you'll have the time of your life enjoying Rocky Top Tennessee!